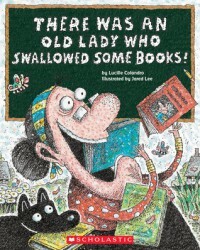 Not as good as some of the other There Was an Old Lady books, but it was still entertaining. The book did not quite flow as nicely as the other books. There were a few verses that just didn't sound quite right, like there were too many or too few syllables in the line. But the book was fun and silly. Jared Lee's pictures are still phenomenal, as always. And I did enjoy the ending. A fun book to get ready for back-to-school season.